Farmers’ reliance on big data is evolving agricultural technology like never before. “Land was the raw material of the agricultural age. Iron was the raw material of the industrial age. Data is the raw material of the information age,” says Alec Ross in his book “The Industries of the Future”. The rising desire for big data in all industries is sweeping through agriculture, but not everyone knows how this trend will evolve or manifest itself on the farm. According to the United Nations’ Food and Agriculture Organization, food production must increase by 60 percent, to be able to feed the growing population expected to hit 9 billion in 2050. Farmers have tended to work from a fixed schedule for planting, fertilizing and harvesting their crops, with limited regard for changing weather, climate or structural details in each individual field. Farming has been an extension of the industrial age. Today, big data in agriculture or precision agriculture, holds the key for farmers to meet these growing expectations. Big data allows farmers to monitor and manage field activities and connect information about local weather and soil conditions, along with weed, disease and pest pressures for farmers’ crops. 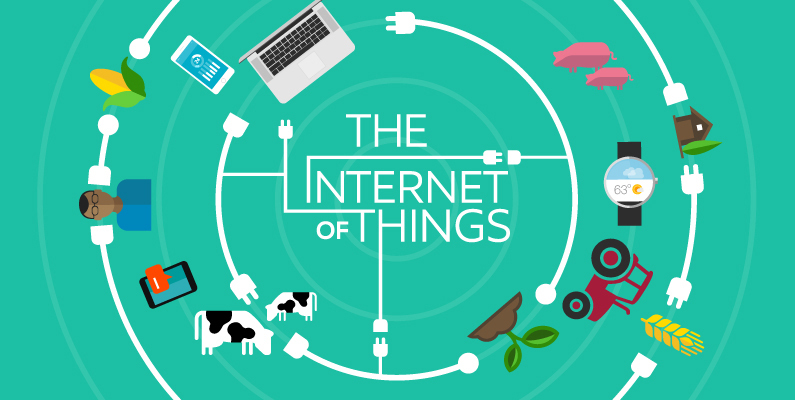 Of all the agricultural technology trends that are taking place right now, perhaps the biggest one is the Internet of Things (IoT). The IoT not only revolutionizes how farmers farm, but how they select and use products on the farm, too. Internet of Things revolves around increased machine-to-machine communication, built on cloud computing and networks of data-gathering sensors. It’s a mobile, virtual and instantaneous connection that’s making all of our technology “smarter”. Since the beginning of time, farmers have worked using a combination of experience and instinct. But today, big data is disrupting agriculture with the use of sensors. These sensors have endless uses that not only create a more sustainable operation, but a more profitable one as well. These sensors are already in use and are being improved every day. Sensors in the fields, which can specify the exact moisture content and composition of the soil. Automated notification via text message when a cow is ready for insemination and when the animal’s body temperature is normal. Sensors that indicate problems or faults with machines on the farm and its operations. Sensors will line the field and feed many forms of data to the cloud. And these sensors won’t just make each farm or acre better, but every square inch of farmland. The collected data will be combined with GPS, weather models and algorithms to provide farmers with a precise set of instructions about what to do, when and where. Instead of spraying a whole field with a fixed amount of fertilizer, the application equipment will be able to sense what each square inch of ground needs and will send out customized fertilizer mixes to each inch. Smartphones and tablets also play a key role for many data services. Machine operators can produce valuable information through their phone by logging start and stop times for specific tasks. When did the sprayer start running? When did it stop? How many pounds were applied? Once completed, the system has a real-time view of the information, providing an easy way to check your work, manage inventory and generate regulatory compliance reports. Of course there has been some resistance to this new technology. In some instances, operators don’t even have an email address—let alone use a smartphone throughout the day. But as farmers begin to see the cost-benefits and the consistency it brings to operations, it’ll eventually be an easy sell. Some of the largest ag companies are discovering the economic value behind this technology and have been purchasing data analytics companies. Seed companies will be able to recommend specific combinations of seeds and fertilizer to each farmer, based on data received from the sensors placed on their individual fields. Many farmers have been doing their best to collect this data in complicated spreadsheets, but today most of this can be automated and the results viewed in real-time. The key is that farmers will need to adopt data systems that can drive outcomes. Rather than spending all of their time with their hands in the dirt, farmers will likely spend increased amounts of time in the office and look more like an information technology company, analyzing data sets and tweaking algorithms to increase efficiency. Precision farming will take agriculture from an industrial-age industry to a digital-age industry. There’s no doubt that it’s going to give agriculture the most disruption, as well as the most opportunity over the next five years. But it will certainly give farmers the best chance of feeding our growing population.